Great quality. I purchased the coffee table also. Very happy with them both. Bring charm and function into your home with this cunning little end table. The solid reclaimed wood has a warm, inviting look, as the natural beauty of the wood is celebrated in the finish. Absolutely beautiful end table! We have the Carbon Loft square reclaimed wood and metal coffee table and this matches very well. The height is perfect and the wood is unbelievably gorgeous! I might just have to buy a second one for the other side of our sofa. Highly recommend for anyone looking to decorate in that rustic chic fashion, honestly I think it would work with many decor options, very pretty! I purchased this with the 42 inch coffee table to go in the living room with out rustic decor. The table is sturdy and well built with solid wood pieces. It sits above our sofa end arm rests so that you can easily access items on the top shelf. I absolutely love the table however the size for being an end table is a little too small. Should have been another 3 or 4 inches wider. The table was very easy to assemble and looks great in our living room. Definitely has that reclaimed look and the wood is heavy and solid. I have multiple reclaimed wood and metal pieces in my living room that I needed to match and this table did the trick. It was easy to assemble, and is nice and sturdy. The wood is a good deep brown with lots of character. I actually bought the coffee table first, then added this end table as I liked the coffee table so much. I would advise the use of coasters, as we got a couple of ring marks from beverages, though they cleaned up later with a wet cloth. The end table is very high end. The quality of the metal and wood is exceptional! I like this end table a lot. It is a very heavy, solid wood. I'm very happy with this purchase. The quality is excellent for the price! The multiple shelves allow for great storage without looking cluttered, and the size of the top table is great. I love the rustic feel of the wood. Beautiful table. This table is a perfect height it is tall so you can see it when you walk into the den. It is actually made of large pieces of reclaimed wood which has been nailed together. The table has metal to support it which makes it sturdy. My decor style is the worn, comfortable, rustic/farmhouse and this table is perfect. This table was easy to assemble and l love the casual industrial / farmhouse style. Very pleased with the quality and the rustic reclaimed wood is so beautiful and so easy to care for. Looks expensive just like those tables in high end catalogs. Such a sturdy little table. I think it makes a great side table. Solid wood and heavy. Not easily tipped over either! Thanks overstock!! Easy to assemble, very sturdy. Looks great with matching square coffee table in compact space in a cabin with small sectional! Charming, get lots of praising from it! Pretty nice. I like this table. Assembly was very easy -- I did it myself. And the table looks great. I purchased the square coffee table earlier and they look good together. I'll wait for another big discount coupon and maybe buy a second end table! 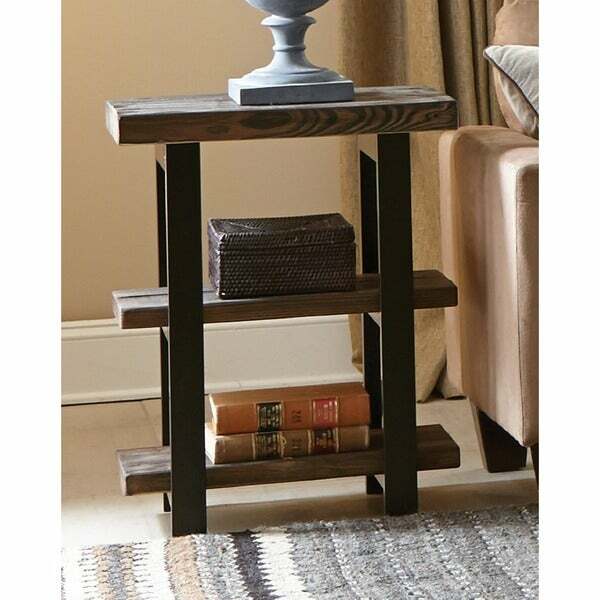 Love this end table. Bought it with matching coffee table. Super easy to put together and looks just like the picture. I’m very pleased! I LOVE this table. I have the coffee table by this same company and I loved it so much, I needed the matching end table. These tables are super heavy and were very easy to put together. "Do they make a matching square end table"
There is not a matching square end table. "The dimensions suggest that this end table has a height of 25-29" - I do not understand how it is adjustable. Does anyone have a clue?" The actual dimensions are 20 inches wide x 15 inches deep x 27 inches high. The 25-29 inch range you see in the specifications is just a range used for sorting purposes. My assembled table measures 27” in height and I don’t see how it could be adjustable. It’s a beautiful table that we use with the narrow side forward, wide side against the sofa. "Where can I find the rug (on overstock website) pictured with this table?" Unfortunately, we do not carry that rug. "It looks like the coffee table is 18" high, which is perfect. Are the side tables really 27" high? That's awfully tall for a side table. Thanks!" Yes, it is 27" high. It was perfect for my xtra large comfy chair....So it depends on your need, however, it is very sturdy, easy to put together and beautiful. It really isn't high...we have a standard size sofa and it lines up perfectly. They are really nice, and worth the money. It is and likes great. It's the perfect height. "Is the metal bronze or black?" "What kind of reclaimed wood is used?" I am not 100% sure. If made in America it is often pine. This seems harder than pine and grainer. I do like it and it has held you well and has a rustic look. "What does this table weigh?" Hello Kelly, the end table weighs approximately 40 pounds. Thanks for shopping with us.